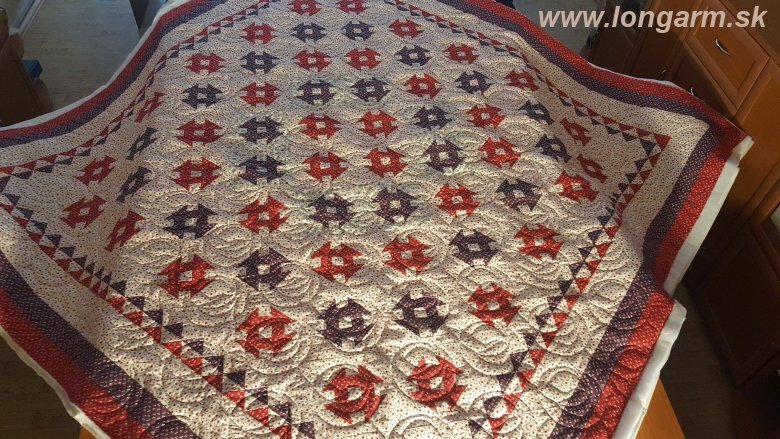 Free hand quilting is created with help of your fantasy ... you are dancing with your needle and try to create atractive stitches, nice shapes and harmony and unity of whole quilt. Price of this quilting is about 15 Eur/ square meter in Slovakia and depends from complexity and density of quilting. Quilting with ruler work requires the training and good practice. 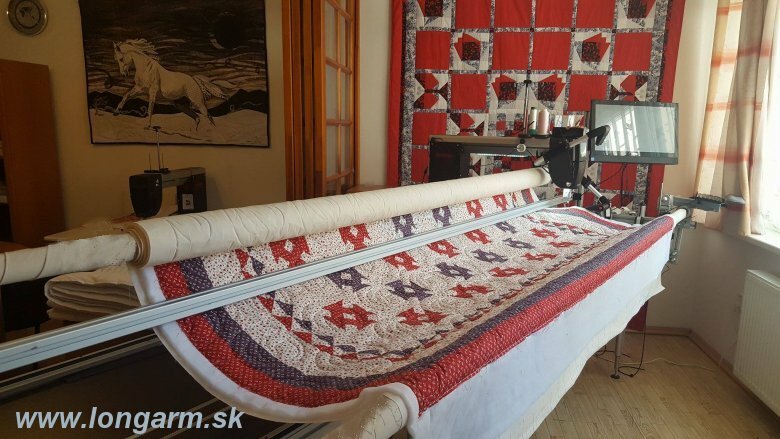 The result of ruler quilting are perfect curves and precise shapes, that can be repeated anywhere where it is needed ... the price of the ruler work is higher in Slovakia and is around 30 Eur per square meter depending on the complexity and density of the pattern. During pantograph edge to edge quilting you use template on shelf of quilting frame. Laser stilus folows line on template and needle creates copy of template on your patchwork. Price of pantograph quilting in Slovakia is around 17 Eur per square meter. The last - technically the most advanced - is motor quilting. You program the pattern to the computer and the control unit gives commands to both x nad y motors. The machine moves according to these instructions either from the edge to the edge or quilt on single blocks and areas till the end of the whole product - a patchwork blanket. Everything is mathematically accurate, shapes and stitches are perfect. Any inaccuracies in the sewing of blocks (for example instead of the squares you managed to create the diamonds) can software easily deform to the right shape. The Bernina Q-matic includes a large Dell computer with full color touch screen and 2 programs. For this blanket I only used the simpler software and its capabilities. It has the same name as the whole motor system = Qmatic. I will leave the second program (Art-Stitch) for creating large-area decorations. Each blanket will be quilted with Q-matic as a picture. The butterfly pattern was selected from a huge library of ready-made designs, and I programmed quilting from Edge to Edge. The price is same as for any pantograph quilting - 17Eur / square meter. If I would program block quilting or blanket as picture quilting, the price would be at the level of rulerwork = 30Eur / square meter and more, depending on quilting demands. 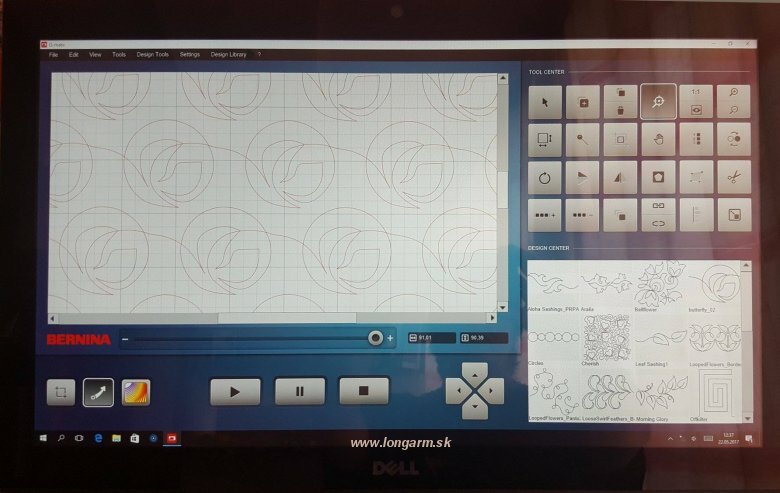 The screen is divided into 3 parts - the bottom right is a selection of several suitable patterns, the top right is choice of functions I want to use for programming and the result of my programming is created on left part of screen. So - how to program, for example, quilting process for this particular blanket? The whole "programming" took me 3-4 minutes. And then I just drank coffee and with pleasure observed in a speechless way, how BERNINA IS WORKING FOR MYSELF. and looked forward to the result.